Gardaí investigating a number of stabbing incidents in the Phoenix Park have charged the man who was in custody in Blanchardstown Garda Station. The 23-year-old man was arrested earlier today. He will appear before the Criminal Courts of Justice tomorrow morning 9 July at 10.30am. Nine people were injured in separate stabbing incidents last night. The incidents happened at a concert by electronic dance act Swedish House Mafia. Three men are being treated at Connolly Hospital, Blanchardstown. Two of them were seriously wounded. Gardaí have appealed for witnesses to contact them in Blanchardstown on 6667000 or at any other garda station. They say they are investigating the possibility that there was more than one person responsible for the stabbings. Meanwhile, gardaí are also appealing for information on the identity of a man who was at the concert but died in Connolly Hospital last night. The man, who was in his early 20s, sought medical attention at the concert, before being taken to hospital. A post mortem is to be carried out later today to establish the cause of death. There were also several arrests for public order offences before and during the concert. In a statement issued by MCD Productions, who organised the event, it said every precaution as far as possible was taken to ensure the safety and security of the audience at all times. "Despite our best efforts (with security and gardaí personnel levels well in excess of the required numbers for a licensed event of this size) there is only so much one can do to combat anti-social behaviour," it said. It added that they are continuing to fully co-operate with gardaí and have handed over all CCTV footage from the area to them. 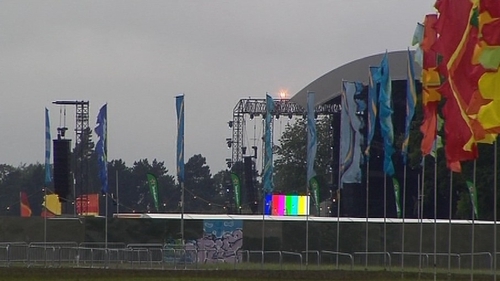 Managing director of MCD Denis Desmond said "we are extremely shocked and saddened to hear that a male adult while attending the Phoenix Park concert on Saturday 7 July suddenly took ill and later passed away in hospital. "The case is being treated by An Gardai Siochana as a sudden death and we are doing everything possible to help them with their inquiries." Opposition justice spokesperson, Fianna Fail's Dara Calleary has called on Justice Minister Alan Shatter to address the rising violence and anti-social behaviour in the capital. Mr Calleary said the rise in the number of instances of violent crime in recent weeks was alarming.